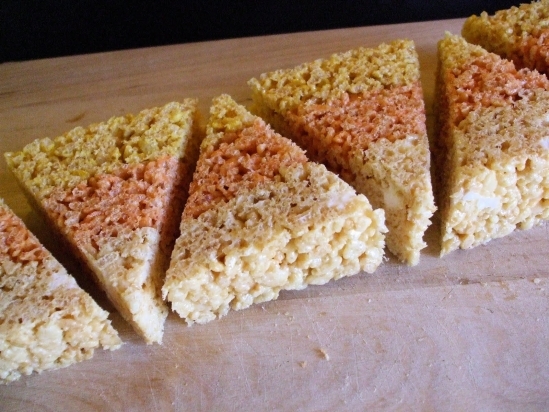 The classic, easy, and delicious rice krispie treat is taken to a whole new level with just 1 ingredient: food coloring! This is perfect for Halloween parties and everyone knows the homemade rice krispie treat is better than the store bought one. You can cut it into squares or triangles, either way it’s great for fall. Rinse saucepan. Repeat step 1 twice: To second batch, add orange zest and enough yellow and red food coloring to tint marshmallow mixture orange before adding cereal, then press into pan. To third batch, add enough yellow food coloring to tint marshmallow mixture yellow. Press third batch into pan. Using your hands, gently mold each treat into a candy-corn shape, or leave as desired. Can I tell you how much I adore these?? They are perfect for a Halloween party. Aw thank you so much!!! Yes theyre perfect!